I would say that I have done my fair share of traveling, which means I have also had my fair share of car rides to the Edmonton International Airport. On my way to EIA recently, I was shocked by freshly poured cement beams and an endless line of construction equipment along the Queen Elizabeth Highway 2. The massive QE II is expanding even more. It was exciting because earlier that day in class, we had just finished talking about neighborhood & population growth and the significant effect it has on cities. In Edmonton, the bulk of this effect is seen in the suburban expansion along city edges, most of it taking place along the Southside. However, after my excitement in seeing my education in the world around me, I got pretty concerned. “Are we on our way to becoming like Texas?!”. To be fair, interstate 10 in Texas is 26 lanes wide; 5x the size that the QE II will be, and serves Houston’s population of 2 million. No doubt about it, Edmonton and Houston have a huge population difference; but Edmonton is a growing fast, and is definitely on its way to becoming Houston Jr. With more and more opportunities to work, play, and live in our city arising every day, Edmonton’s Municipal Development Plan estimates its metropolitan population will reach 2.2 million by 2044. According to the Government of Alberta Transportation website, the expansion will cover 23 km between the south-end of Leduc and the north-end of Ellerslie road, including an off-ramp that will go up and over the QE2, connecting 65th Avenue in Leduc to the QE2. That’s a lot going on for one highway! The construction of additional lanes is solely between Edmonton and the EIA. Will this reduce actually reduce congestion? 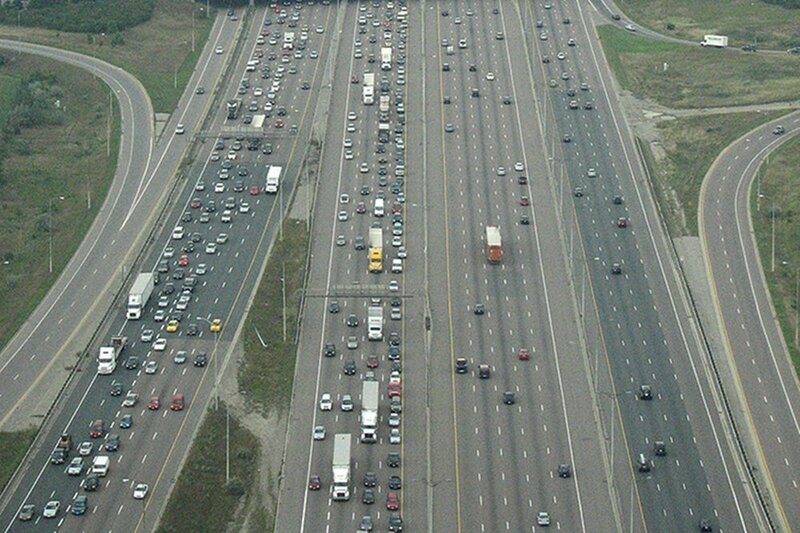 There is no doubt that there has been a need for a more extensive highway, given the growing outer suburbs. Widening highways can induce demand for vehicular traffic; larger roads on Edmonton’s periphery can service more developments that expand beyond Edmonton’s inner ring… which ultimately results in more traffic on the new roads. This unchecked and continuous growth beyond the Anthony Henday has serious environmental impacts. A future with less, green space, and agricultural lots, and more monstrous grey areas is near. Don’t get me wrong, Edmonton’s growth is great. I am so excited to see our city grow, and to welcome all individuals and families from the area and beyond. However, my overarching question is where is the limit our expanding footprint? When will the City decide to stop expansionary greenfield development? There are bigger issues and questions at play within this expansion. Is the congestion so incredibly brutal on the QEII that more and more roads are the only answer? The way I look at it is that the built-form of a City can increase the lifespan and quality of life of its inhabitants. Healthy, green, sustainable communities inspire and influence citizens to interact with their surrounding environment. Living beside a construction ridden highway, that will never stop growing because of our increasing demand to travel in and out of the city without congestion, is not an area I would like to live in. Maybe you travel on the QE2 more than I do and you are really looking forward to the overpass also being developed! I love the idea of ease and stress-free driving. I also love thinking about how the City of Edmonton, does have the capability to grow. But is this highway expansion really necessary? I would love to hear your thoughts on this! Are you excited and eager for this expansion? Are you anti-roads and construction? Or is it too early to tell your thoughts? Please share! A Hidden Gem on the Northside? !